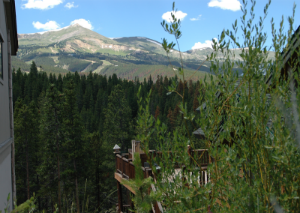 Hardly an exaggeration, the view from the Eagles View condos for sale is birdlike, peering over the ridge of Warriors Mark West looking onto Peak 10. The Eagles View Condos are 10 homes located around a common parking area. Although they are large, and laid out as a townhome, they share the common land so they are condominiums as far as ownership and exterior maintenance are concerned. Here you can enjoy the space of a townhome with all of the perks of condominium living. Start the search for your perfect home with the Eagles View condominium listings below, or learn more about this unique complex. Built in a salt-box style with garages underneath, living area above, and bedrooms on the clearstory up top. Each has a different floorplan, most have basements and all face Peak 10. These views are unrivaled and must be seen to be believed. Warriors Mark West is unique in that it has easy access to backcountry ski and hiking trails. 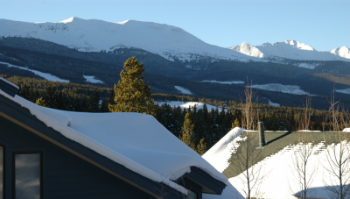 Locals have found ways to ski to and from the Breckenridge Ski resort for those who truly wish to live a ski-in / ski-out condo lifestyle. Size: 1198 to 1786 (varies) sq. ft.
HOA: Breckenridge Home Care, Brian Whitcomb, (970)453-5233. Amenities: views, large for condo, common exterior maintenance, garage, flat parking area, access to trails and skiing. From the southern most stoplight in Breckenridge, at Boreas Pass Road, take a right and head west on Broken Lance Drive. Follow this drive as it curves around the neighborhood, until the stop sign where it joins White Cloud Drive. Climb White Cloud and after it curves back to the south Eagles Ridge Condos will be on the left. An expert from the Breckenridge Associates team is waiting to speak to you! You can call us at (970) 453-2200 or send us a message now.